I was trying to think of something easy and inexpensive to bring to Michael and Karen's for my family's New Year's Day get together. I don't know what made me think of it, but I got the idea for a buttermilk pie. So I searched a few recipes and read a few reviews. This was the result! I decided that a plain buttermilk pie needed something on top of it, hence the blueberries, and I liked the tangy tartness of the buttermilk, so I decided to pump it up a little more, hence the lemons. The flavors go really well together and the texture is a lot lighter than you might expect it to be. Delish!! Everyone gave it two big thumbs up! Roll out pie crust and place in a pyrex pie plate. Crimp the sides to make a decorative edge. In a mixing bowl, beat eggs until frothy. Add sugar, butter, and flour. Beat until smooth. Stir in vanilla extract, lemon juice, lemon zest, nutmeg, and buttermilk. Pour into pie shell. Bake for 40-60 minutes or until the center is set. Cool completely. Top with pie filling. Not a fan of lemon? Try orange instead! Not a fan of blueberries? Try strawberries or raspberries! Any combination will work! The original recipe was a bit too sweet, so this is the tweaked version (I reduced the amount of sugar, and added lemon zest!) 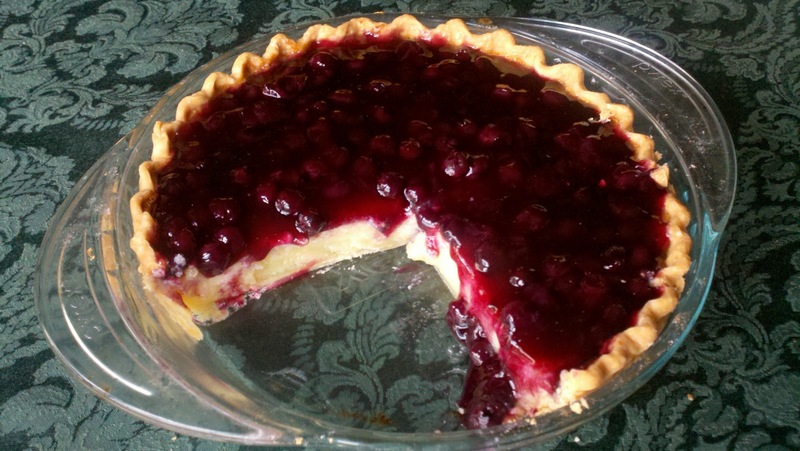 The blueberry filling is already very sweet, so you need the tangy to balance it. My brother, Jimmy, suggested adding fresh blueberries to the canned pie filling (just like his wife, Janet, always does), just to add a little more tart to the sweet. Sounds good to me! Thanx Jim!